So fierce in the cold. 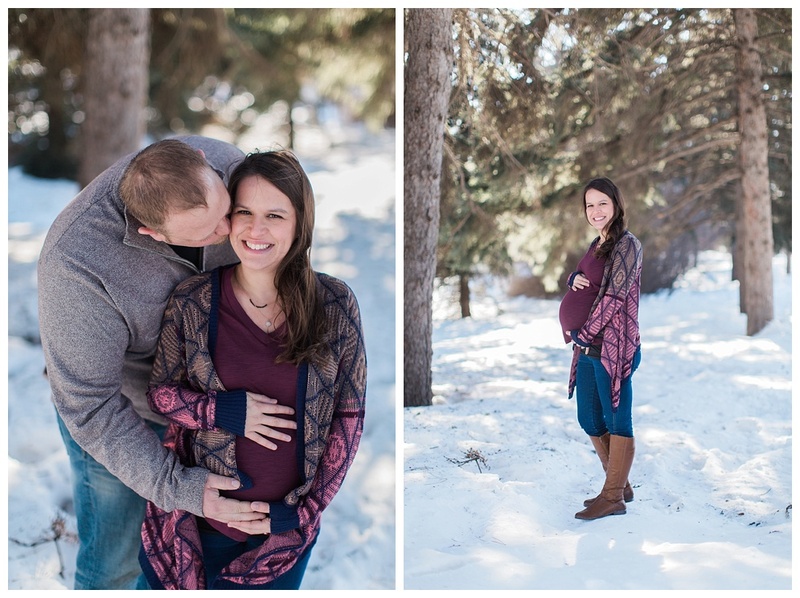 I joined Sarah at her home south of Glen Ullin this winter to document her pregnancy. We were joined by not only her husband, but a dog and a horse :) She was a champ outside in the freezing cold, rocking one of my maternity photography dresses. These two are so adorable together. Last year I had the pleasure of photographing their beautiful wedding and this year they are welcoming a baby boy to the family....oh yeah and a cute puppy! "It's only cold if your standing still." Julianna and Nathan joined me on a very bitter afternoon in February to capture their maternity pictures. We had envisioned a beautiful snowy day with nice trees, you know, those pinterest type pictures. Of course, it being North Dakota, we settled for knee deep snow, below freezing temperatures and wind. Julianna was such a trooper! We literally burned 200+ calories trekking threw the snow and questioning if we all still had limbs after the session. It was a "warm" fall afternoon for a maternity session with Janene, Bucky, and their two pups! Their family of 4 has since grown to 5 with the addition of a baby girl. "She is like a wild flower; beautiful, fierce, and free." "But I love you so much more than just to the moon and back." "Blame it on my wild heart"
When Mindy contacted me about photographing her maternity session in Killdeer, I was over the moon excited. I love, love, love photographing at new locations and Killdeer is easily one of my favorite spots! The fact that Mindy & Matt were completely adorable together made this session one of my favorites for 2016. We had to fight the wind and hike a bit but I think these images are totally worth it!